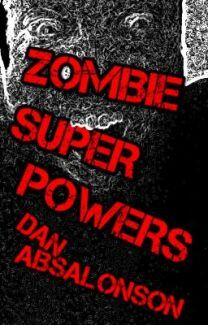 Dan Absalonson | Author of SciFi & Fantasy: Zombie Super Powers is Halfway Written! Hey guys! I'm excited! Last night I wrote in my novel for the first time in a very long time. It felt great and even though I'm an outliner I learned about one of the character's backstories as I finished the chapter up. It was a big chapter because it's the last one in the first part of Act II so now I'm right at the midpoint. Now they're making plans to fight back instead of run and react to the problem. My plan knowing how many chapters this book will have and about how many words I wanted in each chapter shows me that somehow I got to the midpoint and was only off by 12 words! I'm at 30,012 words at the end of chapter 12 and there are going to be 24 chapters total. A short sweet 60K word young adult novel called Zombie Super Powers. I know that word count of the first half of the book will change with editing but hey - I've reached the halfway mark! Now I just have to get to Act III where all the really cool stuff happens. It should be a fun ride getting there though with some big realizations for the main character. I can't wait to write it. It feels so good to be writing again in this book! So I figured out how many words I need to write a day to finish this thing before NaNoWriMo so I can be set to start a new book on November 1st. It's 517 words a day until October 31st. That will get me finishing this book on time. That's the game plan. You can track my progress with the nifty word count meter I put on the top right hand side of my website. You can also be an Alpha reader if you want and read the new chapters as they get published to Wattpad here. I'd love any feedback or comments you have. I'm so excited to see that meter fill up and finish this novel! It's my forth novel and I'm hopeful it's the first one I'll publish. After I write my fifth novel during Nanowrimo then finish the other two novels I started I think I'll try and do a massive overhaul on my third novel and either rewrite it or rewrite lots of it. We'll see. I'm excited to be writing again! Thanks for stopping by!